low level of formal insurance uptake is attributable to public mistrust, low public awareness and a narrow insurance product range – especially for low income earners. Uptake of formal insurance was 6% in Kenya, 9% in Rwanda and 15% in Tanzania. 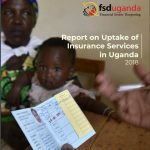 This means that uptake of formal insurance in Uganda is the lowest in the region.